1. Ian Johnston. "Platelet Factor 4 And Von Willebrand Factor Form An Immunogenic, Prothrombotic Complex In Heparin-Induced Thrombocytopenia." University of Pennsylvania.2018. 2. Ravi Holani, Fernando Lopes, et al. "Cathelicidin senses enteric pathogen Salmonella typhimurium/LPS for colonic chemokine generation: a new innate immune role for a host defense peptide." bioRxiv. 2018. 3. Jinghua Jiang , Fei Ye, et al. "Peri-tumor associated fibroblasts promote intrahepatic metastasis of hepatocellular carcinoma by recruiting cancer stem cells." Cancer Letters.17 July 2017 1/10. 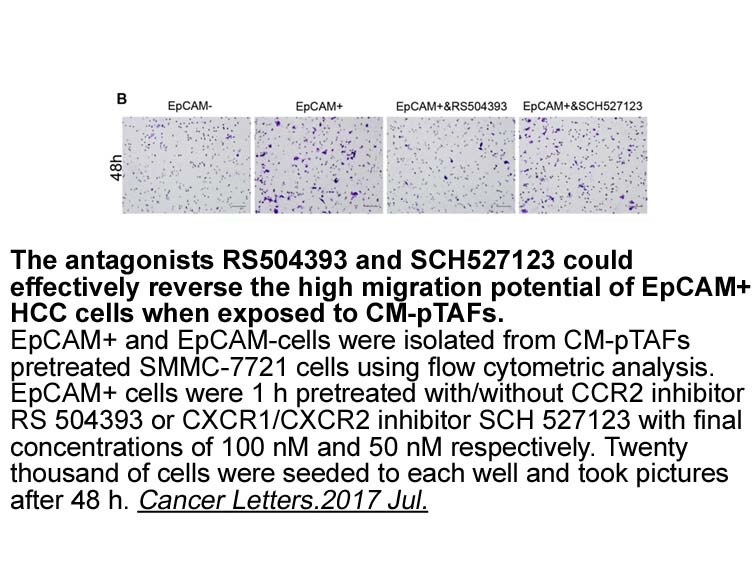 Description SCH-527123 is a potent antagonist of both CXCR1 and CXCR2 with IC50 values of 42 nM and 3 nM, respectively. SCH-479833 or SCH 527123 inhibited the melanoma cell proliferation, chemotaxis, and invasive potentialin vitro.Treatment of melanoma cells with SCH-479833 or SCH 527123 also inhibited tumor growth. Histologic and histochemical analyses showed significant (P<0.05) decreases in tumor cell proliferation and microvessel density in tumors. Moreover, we observed a significant increase in melanoma cell apoptosis in SCH-479833- or SCH 527123-treated animals compared with controls. Sch 527123 was bound with high affinity to the CXCR2 receptors of mouse (Kd=0.20 nM), rat (Kd=0.20 nM), and cynomolgus monkey (Kd=0.08 nM) and was a potent antagonist of CXCR2-mediated chemotaxis (IC50~3– 6 nM). In contrast, Sch 527123 bound to cynomolgus CXCR1 with lesser affinity (Kd=41 nM) and weakly inhibited cynomolgus CXCR1-mediated chemotaxis (IC50 ~1000 nM). Oral treatment with Sch-527123 blocked pulmonary neutrophilia (ED50=1.2 mg/kg) and goblet cell hyperplasia (32–38% inhibition at 1–3 mg/kg) in mice following the intranasal lipopolysaccharide (LPS) administration. In rats, Sch-527123 suppressed the pulmonary neutrophilia (ED=501.8 mg/kg) and increase in bronchoalveolar lavage (BAL) mucin content (ED 50≤ 0.1 mg/kg) induced by intratracheal (i.t.) LPS. Sch-527123 also suppressed the pulmonary neutrophilia (ED50=1.3 mg/kg), goblet cell hyperplasia (ED 50=0.7 mg/kg), and increase in BAL mucin content (ED50<1 mg/kg) in rats after i.t. administration of vanadium pentoxide. In cynomolgus monkeys, Sch-527123 reduced the pulmonary neutrophilia induced by repeat bronchoscopy and lavage (ED50=0.3 mg/kg). 1. Singh S1, Sadanandam A, Nannuru KC et al. 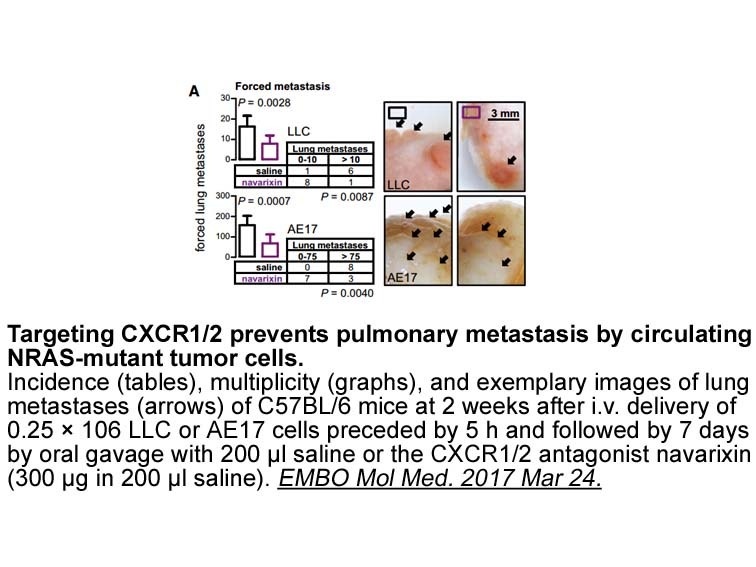 Small-molecule antagonists for CXCR2 and CXCR1 inhibit human melanoma growth by decreasing tumor cell proliferation, survival, and angiogenesis. Clin Cancer Res. 2009 Apr 1;15(7):2380-6. 2. Chapman RW1, Minnicozzi M, Celly CS et al. 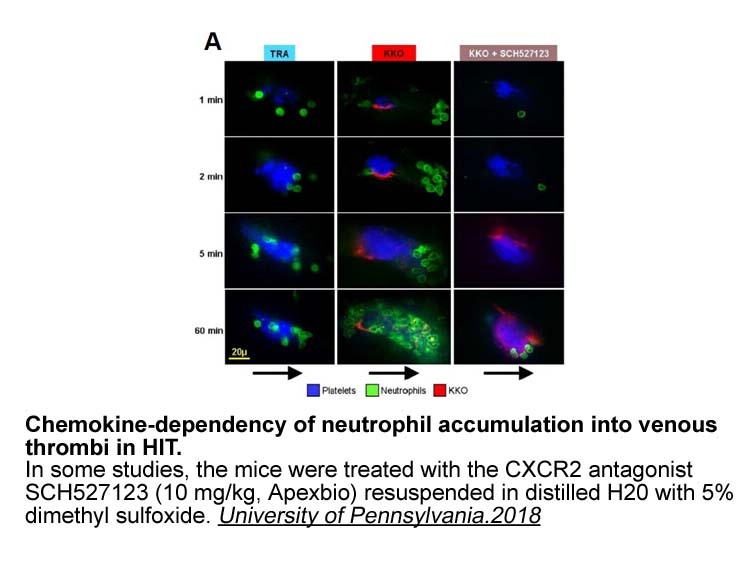 A novel, orally active CXCR1/2 receptor antagonist, Sch527123, inhibits neutrophil recruitment, mucus production, and goblet cell hyperplasia in animal models of pulmonary inflammation. J Pharmacol Exp Ther. 2007 Aug;322(2):486-93. Epub 2007 May 11. 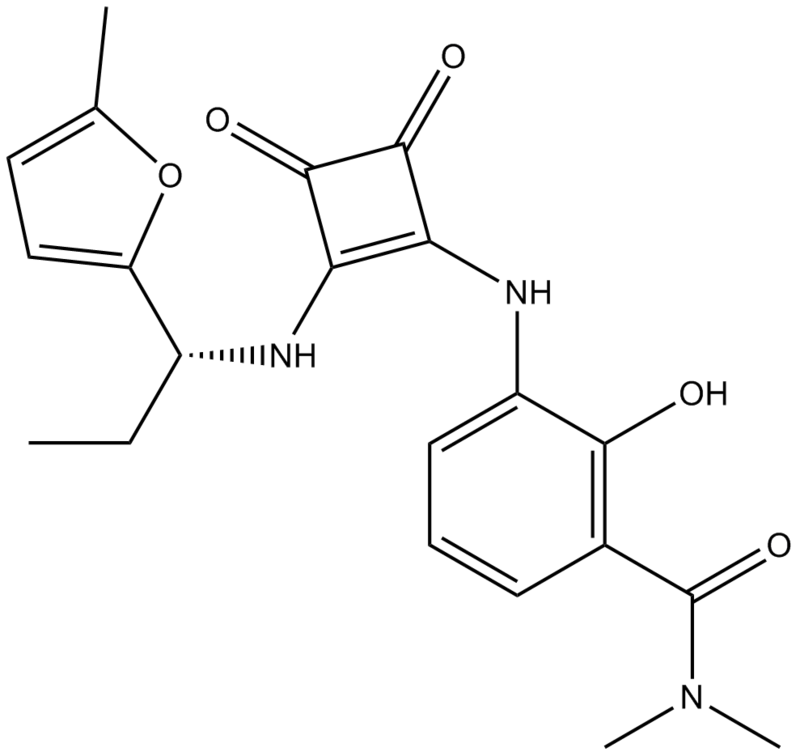 SCH-527123 is a novel, selective CXC chemokine receptor 2 (CXCR2) antagonist. 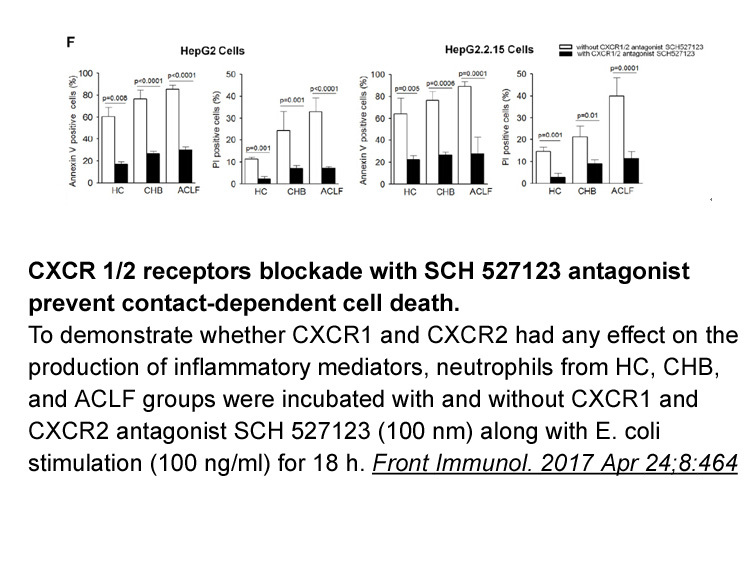 SCH-527123 was able to suppress CXCR2-mediated signal transduction as shown through decreased phosphorylation of the NF-κB/mitogen-activated protein kinase (MAPK)/AKT pathway . Cells were treated with increasing concentrations of SCH-527123 for 72 hours and showed dose-dependent growth inhibitory activity with IC50 (72 h) values ranging from 18 to 40 μmol/L. Importantly the IL-8–overexpressing cells showed a higher IC50 (72 h) concentration of SCH-527123 than parental cells [HCT116 and E2 (P < 0.005): 28.9 ± 0.02 μmol/L and 39.5 ± 0.01 μmol/L, respectively; Caco2 and IIIe (P < 0.005): 18.8 ± 0.03 μmol/L and 25.5 ± 0.02 μmol/L, respectively]. Therefore, SCH-527123 decreased growth inhibitory activity in colorectal cancer cell lines .
. Holz O, Khalilieh S, Ludwig-Sengpiel A et al. SCH527123, a novel CXCR2 antagonist, inhibits ozone-induced neutrophilia in healthy subjects. Holz O1, Khalilieh S, Ludwig-Sengpiel A et al.
. Holz O1, Khalilieh S, Ludwig-Sengpiel A et al. The CXCR2 antagonist, SCH-527123, shows antitumor activity and sensitizes cells to oxaliplatin in preclinical colon cancer models. Mol Cancer Ther. 2012 Jun;11(6):1353-64.